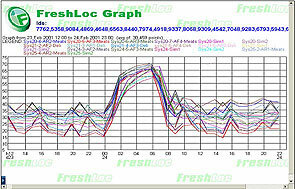 FreshLoc provides an extensive package of reports for both the managerial and operational levels. Fresh-Look® Reports provide a snapshot of all monitored areas. They are automatically created and emailed on a periodic daily basis depending upon local health code requirements for temperature monitoring. They can be emailed to any number of users and do not create the need for additional paper reports. Data from the Fresh-Look® Reports can be graphed for corrective action or equipment performance analysis. 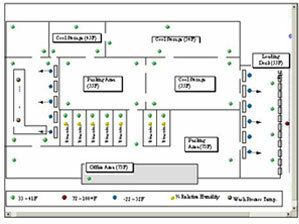 For ready-to-eat areas, the graphing feature can be used to analyze daily operations in deli or hot-serve areas. Map-View® provides managers an “at-a-glance” on-screen report of the status of their facility. It shows an overhead view of the facility with color-coded sensor points that change with temperature variations. Any areas out-of-spec can be immediately identified.